I’m bringing fall into my living room this season with an easy NO SEW BURLAP LEAF PILLOW! Fall is my favorite season… I love everything about it! Chilly weather, apples and pumpkins and of course the falling leaves! Lots and lots of leaves! Four other inspiring bloggers are also sharing their NO SEW talent! 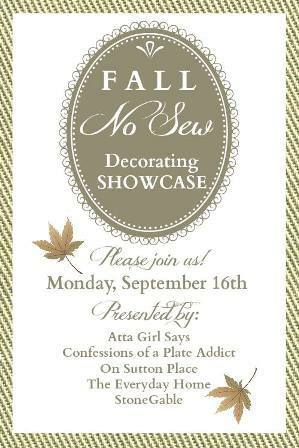 Make sure you visit their blogs for all their fall creativity! 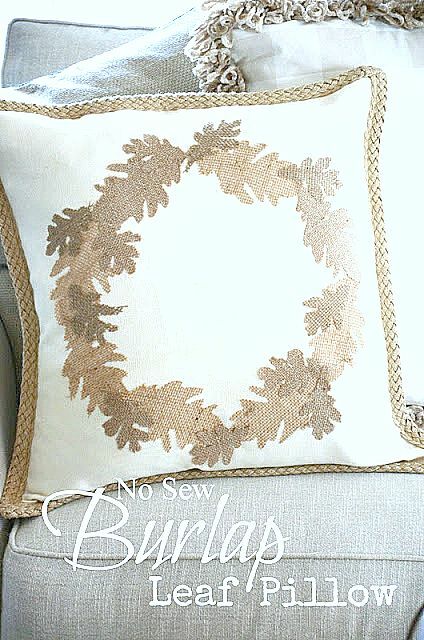 Making my NO SEW BURLAP LEAF PILLOW is easier than you think… you start out with a store bought pillow cover. You don’t even have to make the pillow!!! 1. Trace leaves on to the shiny side of fusible webbing. 2. 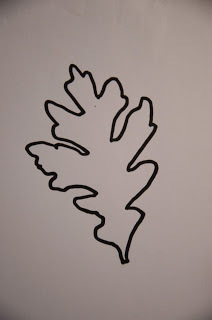 Cut out leaves, leaving a 1/2 inch or so edge around them. Put fusible webbing rough side down on to burlap. Iron fusible webbing onto burlap by using a hot iron/ no steam for 8-10 seconds. 4.Carefully peel of the parchment backing from the leaf. There will be a shiny film of fusible web on the leaf. 5. 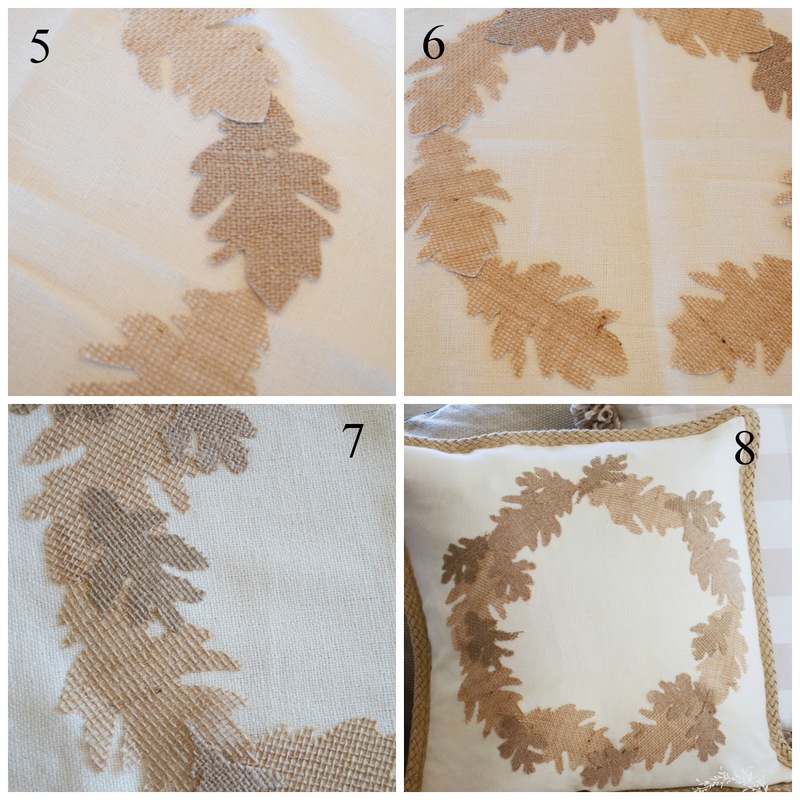 Iron the leaves on to the pillow cover according to package directions. Arrange the smaller leaves on the wreath and iron the smaller leaves on to the pillow cover according to package directions. 8. Let cool. If any leaves did not stick well, affix them to the pillow cover with stitch witchery, following package instructions. Put the pillow insert in the pillow. Remember to pin this to your Pinterest DIY or BURLAP or FALL boards. You can follow me on Pinterest and see what I’m pinning daily HERE! This is such a neat idea! It can be applied to many different occasions for a cost-effective change. Easy too! 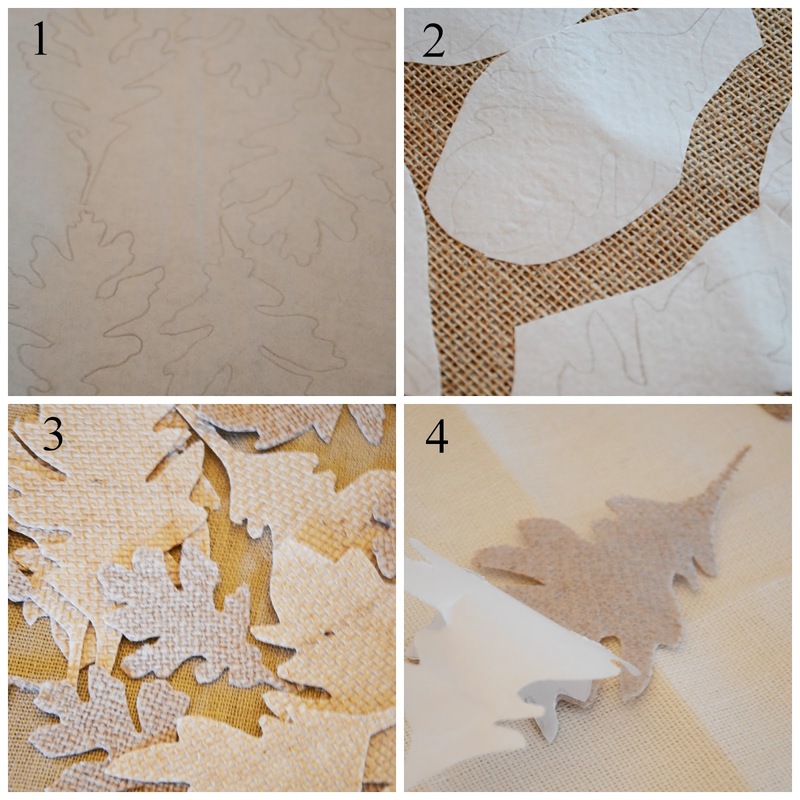 Hi Yvonne – for your autumn leaf no-sew pillow, where did you get the SMALL leaf form? I think the link might have disappeared from the post. Have been praying for your physical suffering with your ankle, that you would heal well, but even more important … that you would remember God’s faithfulness to you over the years, and cling to Him even more. I keep looking for the hanging rack you made using plates and have not seen it yet. Have I missed it? Your pillow is stunning! I love that it is so easy too. Love it so I had to try it…you can see mine at http://thebfarm.blogspot.com/2013/10/final-laundry-room-reveal-and-some-fall.html where I give you a shout out for the inspiration and tutorial. I’m so enjoying your blog and feel a connection to all you do in your beautiful home. You’re my favorite blog and find everything you do with such good taste. I would love to start my own blog, but am not sure where to begin. Any helpful hint would be so appreciated. Just do it! There is so much that you just have to learn as you go. The biggest tip I could give you is to not delay… do it! When you do send me a link… I’ll want to visit. this is just gorgeous, Yvonne. such beautiful soft neutrals for your wonderful Living Room! I LOVE all the projects you smart gals came up with! Yvonne, I adore your no-sew falling leaves pillow! Beautiful in its simplicity and can be adapted so many different ways! I’m ready for fall!! oh i am wild over this design… my colors, my season, my pillow! 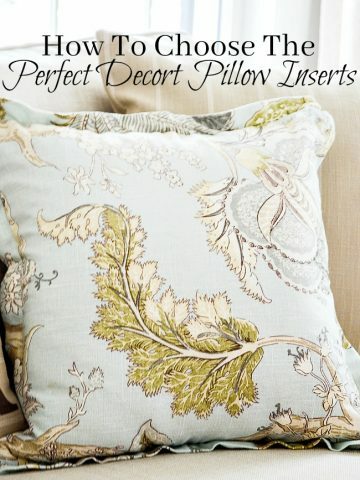 i wish i had an outlet around to get more of those perfect pillows, i love your combo! Super cute…and since I don’t sew…hmmm! I like it even better. What a gorgeous pillow! Great job and wonderful tutorial. How pretty Yvonne. I am all over the no sew deal, love it! 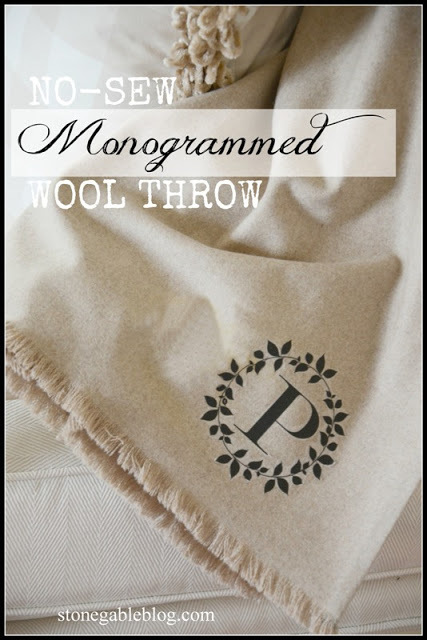 Yet another beautiful and easy project from blogland’s Queen of Chic! You rock! I love it, Yvonne! It looks like it is straight out of a Pottery Barn catalog. Nice job. You blow me away, that is SOOO gorgeous! 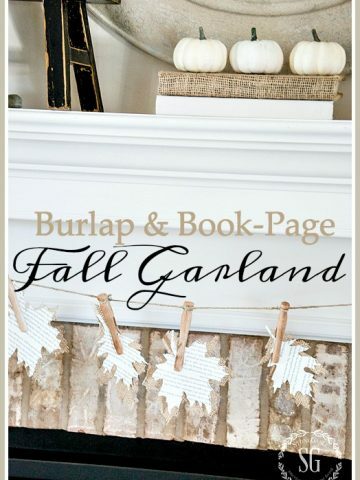 You could so easily sell those, what a beautiful way to welcome fall into any home! Yvonne, that pillow is absolutely beautiful! I think that what pulls it all together is the natural looking braid trim on the pillow. I do alot of sewing but I definitely have to try this!! Thank you for sharing. anything I don’t have to sew is my kind of project! Yvonne, once again you hit a homerun. Your DIYs, decorating and tablescapes are always so classy and professional looking….I am just in awe. By far, you give me the most inspiration of any blogger I have seen. I’ve told my friend Suzy of Worthing Court, we may have to take a road trip and show up on your front porch one day! !…just kidding, I would never stalk you LOL. Love the simplicity of this project Yvonne, as always you are spot on with your eye for simply beautiful decorating. Thanks for sharing. What a terrific Autumn pillow Yvonne! I absolutely love it! Thanks for sharing the tutorial too! The kitchen table and chairs were custom made from in a little local shop. Sorry I did not paint the so I can’t answer that. I am just fine with having only 1 oven. Although I would have loved to have wall ovens, my pantry was more important. I love my cooktop from Jenn Air and my wall oven works great but I find the computer screen hard to see and a little complicated. It is also a Jenn Air. If I had to do it again, I’d probably go with my second choice Kitchen Aide. The were quite pricey, but we got a $1,500.00 dishwasher for free. So they were worth the price. I LOVE my Jenn Air dishwasher, so all in all it was was a good choice! Thank you. It’s so sweet of you to share. I’d love to try this. Also, would you mind sharing two bits of your decorating info. I’d love to paint my breakfast nook table and shares similar to yours just off your kitchen. The chairs are black and the top of table and seat of chairs are stained a dark stain. Would you mind sharing the colors. Also, I have a similar kitchen issue. I’ve always wanted to have double wall ovens but our cabinetry will not allow for the space because of a pantry unless we completely tear it out which seems very wasteful to me as I use the pantry. I love how you solved your problem with a counter stovetop and a wall oven underneath built in a cabinet. Was it hard to do or terribly expensive. Would you mind giving the name brand of oven and how it was done briefly. Thank you. Love your blog and your love of tablescapes. You give me so many great ideas and recipes. I don’t sew and I’m paying very close attention to this series! Yvonne, that is just darling. You did a wonderful job, it’s just beautiful. I love ALL your pillows and they are always a great inspiration. I was looking for the “No Sew” tutorial on the banner. I know, I know, I’m late to the banner party but mention no sew when I want to make one for an old window and I’m all on board. I hope you can tell me where to link. Good Morning Yvonne, This is a fabulous idea. I do sew, but you have certainly turned my head with this cushion. You are a very talented and inspiring lady. Your pillow is so pretty! Oh my cuteness, Yvonne! You are giving me so many ideas!!! 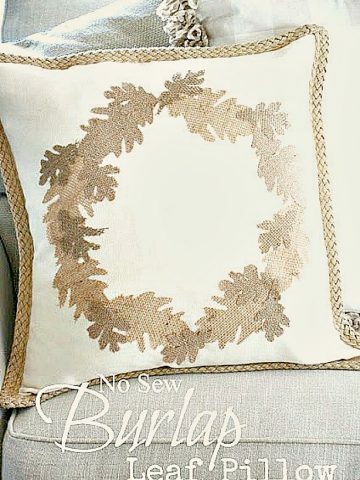 I love making my own pillows, but haven’t thought about repeating a pattern in a wreath form…genius!!!! Love ya! What a great idea, I am not really a sewer, more of a decorator, however, I think Ihave an idea for your pillows. I came across your blog looking for link parties, do you still run one? I have a guest bedroom makeover I would love to share. Yes, Please share at TUTORIALS TIPS AND TIDBITS. Link goes live every Wednesday at 8:00 pm. We love love love makeovers! Hope you join us! I LOVE it! 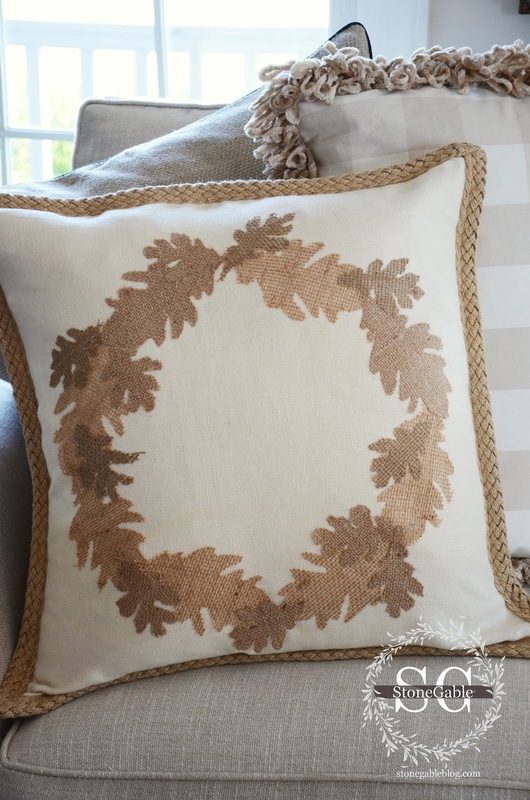 Your leaf pillow is a perfect soft look for Fall. 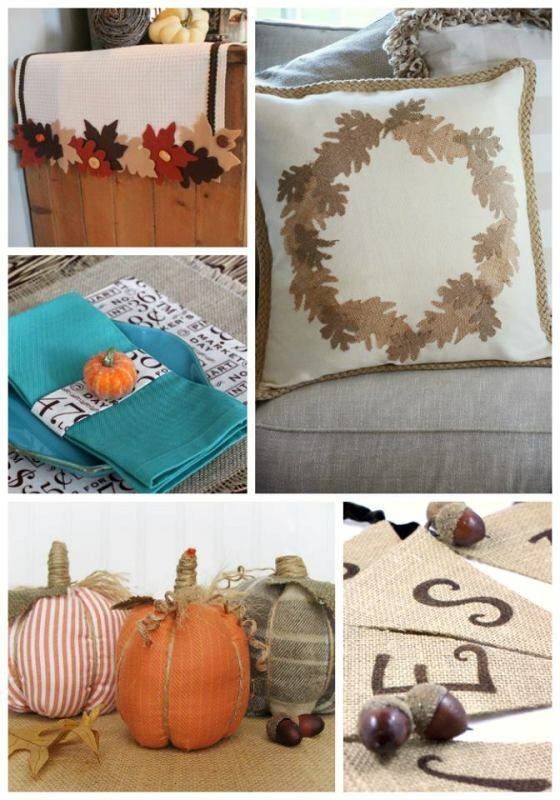 Great choice of pillow and burlap colors. I love it Yvonne. Beautiful job and oh, so clever. Very pretty, Yvonne! It puts me in the fall mood and you make it looks so easy! Thanks for the instructions! 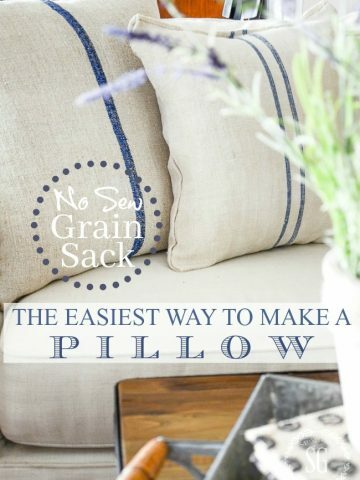 Thank you for sharing this beautiful pillow idea! I hope to make it this fall. Very pretty! So natural looking and full of texture. So pretty and I LOVE that it is no sew!! Fabulous!! Ta-Da is right! That is gorgeous. I can’t believe how you did that, it looks so beautiful. I’d never guess it was attached that way? You’ve got such great style!! Thanks for this easy-peasy tutorial, Yvonne!